Do you ever feel like Facebook is changing so fast it's hard to keep up with it all? Don't worry, even the top Facebook marketers feel that way sometimes -- especially as Facebook continues to make it harder for marketers to get the results they want. Facebook moves at a super fast pace, and if you stop for even a moment, it's easy to fall behind. That's why it's important to focus on keeping your Facebook marketing skills as up-to-date as possible in the simplest ways possible. 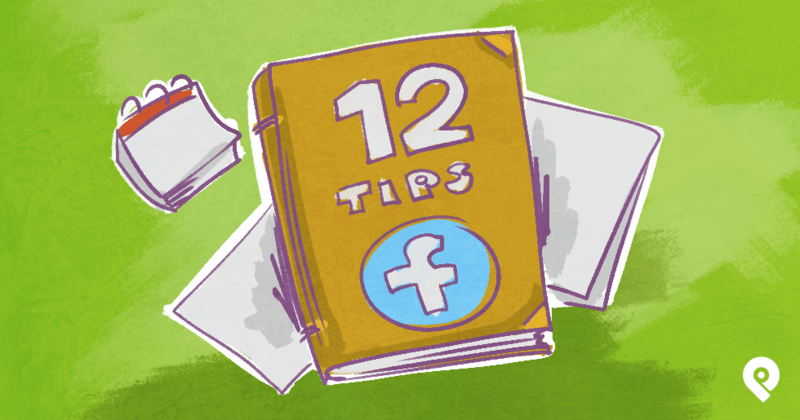 In this post, I'll share 12 of the best Facebook marketing tips that you can begin using right now. If you're an active user of Facebook, then you can move on to number 2. If you're not -- then this is where you should start immediately. To effectively market to Facebook users, you need to be a Facebook user. This means you need to dive into all of the Facebook features you use to market your business -- but from a consumer perspective. Use Facebook on your desktop and your mobile to see the difference in experience. Like some of the businesses you buy from on Facebook, as well as a few celebrities, sports, and other interesting pages. After you like the page, choose the option to either get notifications from or see posts first in your news feed from those pages. When you see posts, engage with them. Join some groups that match your interests. Look at the ads that appear in your news feed and the right sidebar. 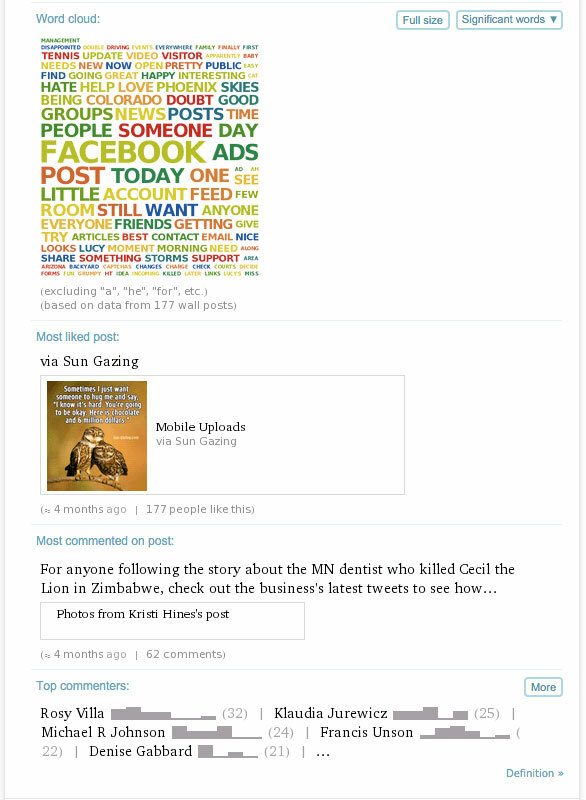 Pay attention to posts from friends that either link to or are shared from other business pages. If you added Instagram as a placement option for your Facebook ads, get Instagram on your phone, follow a mix of individuals and businesses, and browse the news feed there too. Also, pay attention to ads that appear in your Instagram news feed. Unless your business develops games on Facebook -- skip the games and any invitations to play them from your friends. As you start to become a regular user of Facebook, you will naturally learn what works for you and what doesn't. That knowledge can be easily applied into your own Facebook marketing strategy. *Note that this tip should really apply to all social networks. If you want to use the network for marketing, you should be using the network. Whenever Facebook plans to roll out a new feature, they'll announce it on their Newsroom blog. This will help you stay up-to-date on newly available or upcoming changes to the Facebook platform. Anything that affects user experience on Facebook (particularly in the Product News category) will affect your marketing. There are thousands of posts about the best Facebook marketing tips out there -- many of which tell you that you should or should not be doing something. It's important to remember that no matter how authoritative the source is, not everything will apply to you and your business. What works for one small business owner may be a waste of time to another. What works for one corporation may be a huge waste of investment for another. Most importantly, if you don't feel comfortable doing something, it's not going to work well for you or your audience. So if you read something and think that it's not right for you, don't feel bad about skipping that advice. Sometimes we are so overloaded with great information that we consume it -- but we don't apply it. 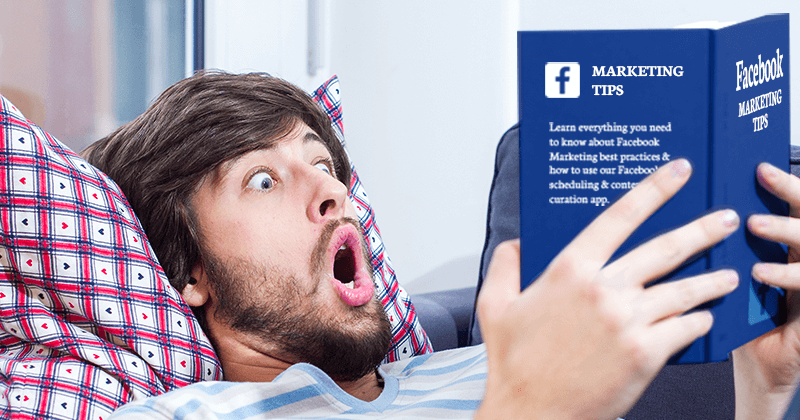 So instead of focusing on reading 100 tips about Facebook marketing every day, sharpen your Facebook marketing skills by actually applying one thing you read each day. Or apply one thing you read each week (depending on how hectic your schedule is). 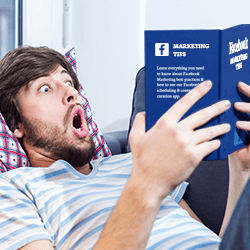 Your Facebook marketing skills don't improve by reading - they improve by doing. Don't allot a huge chunk of time to reading each day, instead allot a huge chunk of time to implementation. 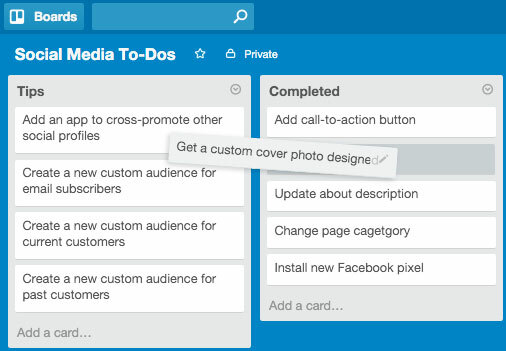 You can use a simple paper to-do list to keep track of the tips you want to implement -- or utilize tools like Trello. Create a card for each tip you find -- then move that card into your completed list once you've done it. 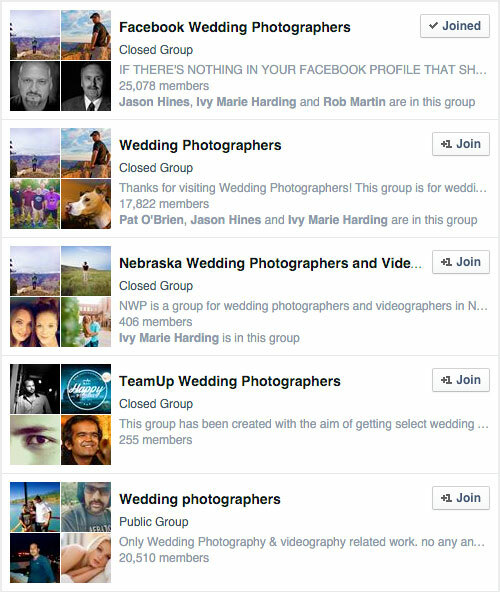 Facebook marketing groups come in two forms: chock full of extremely valuable information or utterly useless spam. 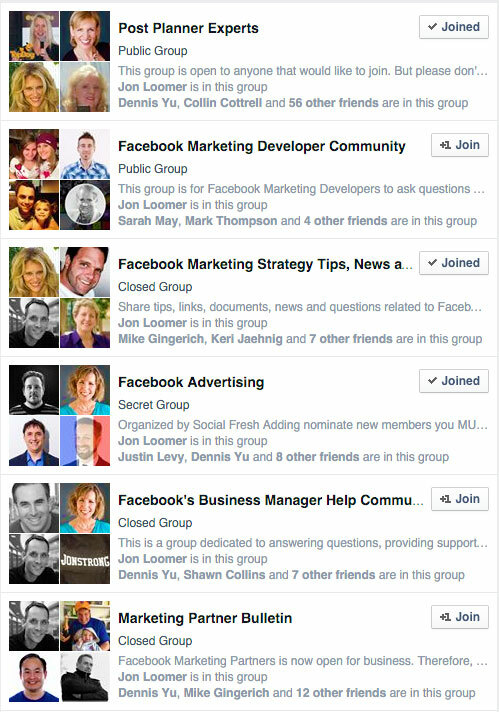 One somewhat sneaky way to find the best groups is to look at the groups the well-known Facebook experts belong to. 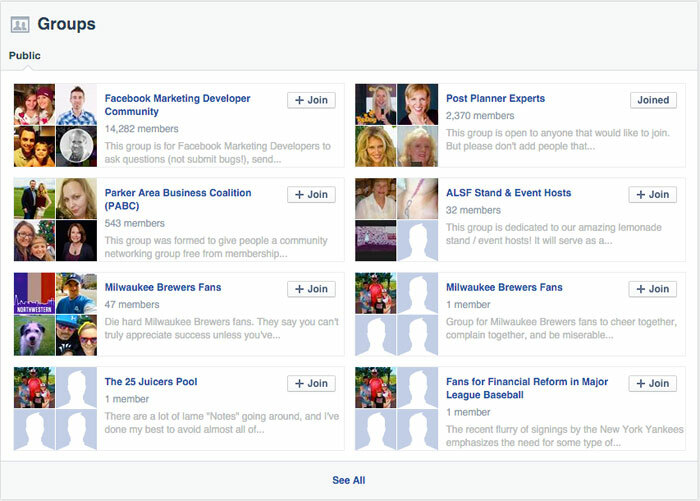 Or by using the Facebook search box to search for groups that Jon Loomer belongs to. His page is followed by the official Facebook for Business page, so we can safely agree he's a trustworthy Facebook marketing expert to follow. This search is actually more valuable because you will get their closed groups as well as their public ones. Since Facebook marketing advice is not one-size-fits-all, it's also good to join groups in your niche or industry. Preferably groups of people marketing in your niche or industry, but general groups for business owners works too. Join them and do some searches for best Facebook marketing tips, marketing on Facebook, advertising on Facebook, Facebook advertising, etc. That will point you in the direction of posts that offer some helpful advice (specific to your business) about what works and what doesn't. The gems of advice will almost always be in the comments. Did you enjoy science in school? If so, turn your Facebook marketing into a science class by experimenting. 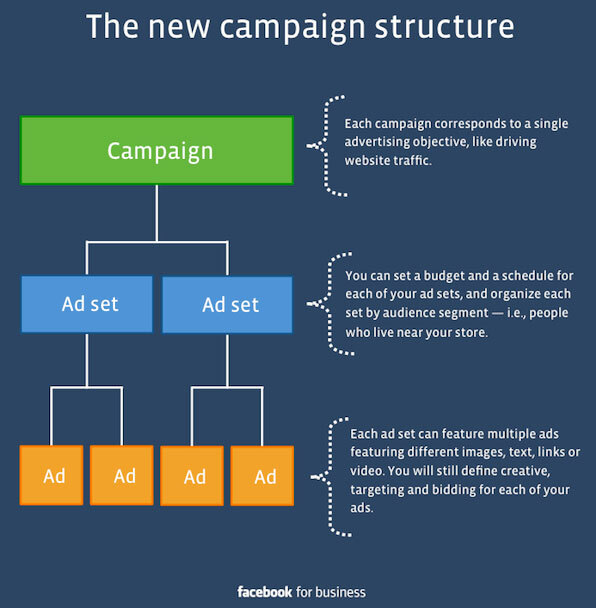 Experimentation can especially go a long way with ads -- thanks to the new ad campaign structure. 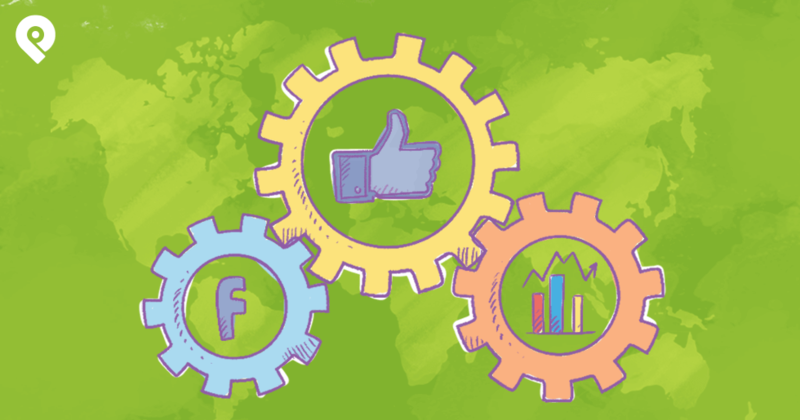 Experimenting doesn't just help you sharpen your Facebook marketing skills - it helps you figure out what will work the best for your business and Facebook marketing goals. Got a hobby outside of your main business? Try marketing that for a while on Facebook. Sometimes getting into something new or something personal will help break the monotony and spark new marketing ideas that can be applied to your main endeavor. 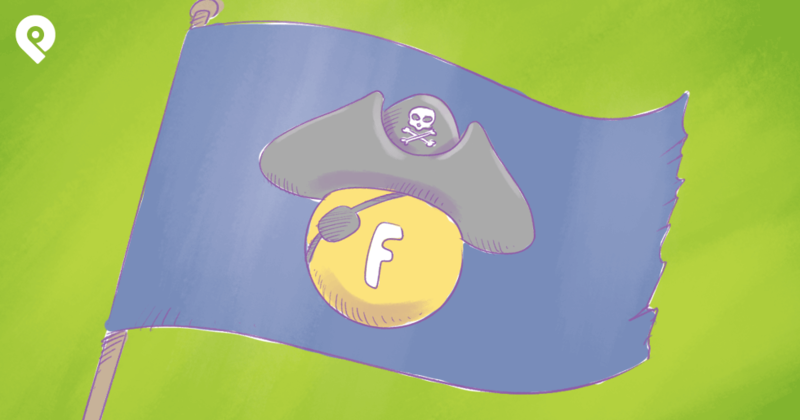 One of the challenges Facebook marketers face is… Facebook itself. You log in, ready to work on your Facebook page, and then you see that post from a friend or notification from a group that takes you down the rabbit hole of everything that has nothing to do with your work for the next 15 minutes. If you're lucky. There are two ways to block out the distractions that come with your personal profile. 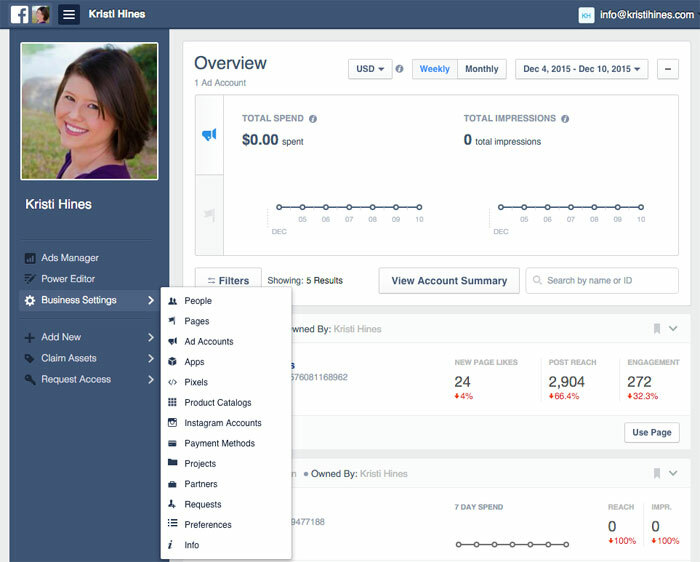 The first is to use Facebook Business Manager. 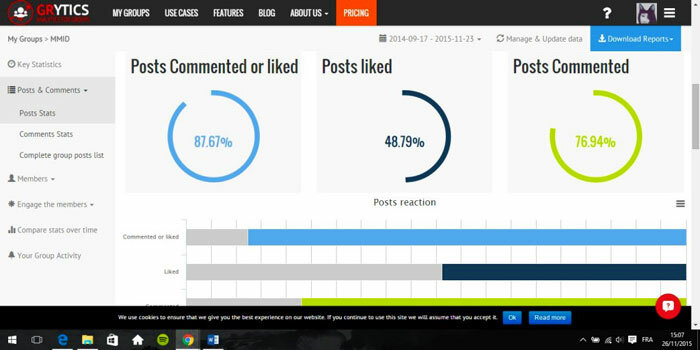 That will allow you to access everything - your pages, your insights, your ads manager, your power editor, etc. - without seeing your personal news feed or notifications. Once you've set it up, you just go straight to business.facebook.com to bypass everything else. If you're not a fan of Business Manager -- the other alternative is to use your Facebook pages bookmarks and log in as the page you want to use. 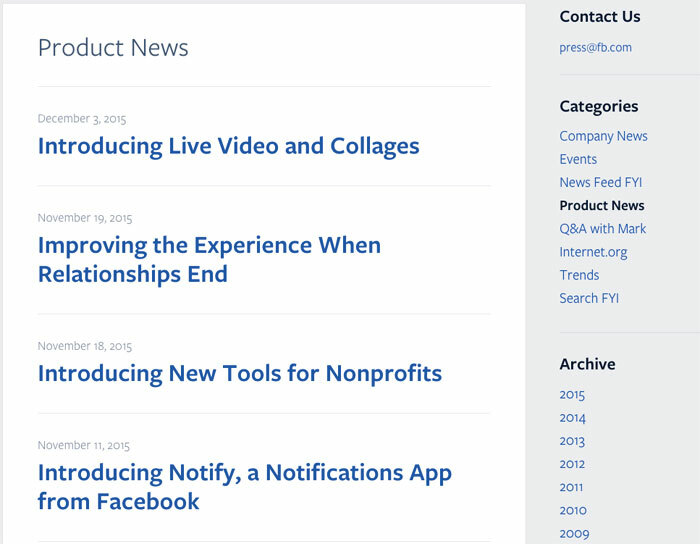 This will keep your news feed focused on updates from pages you've liked with your page. But you'll still have to get out of this if you want your ads manager or other Facebook business assets. 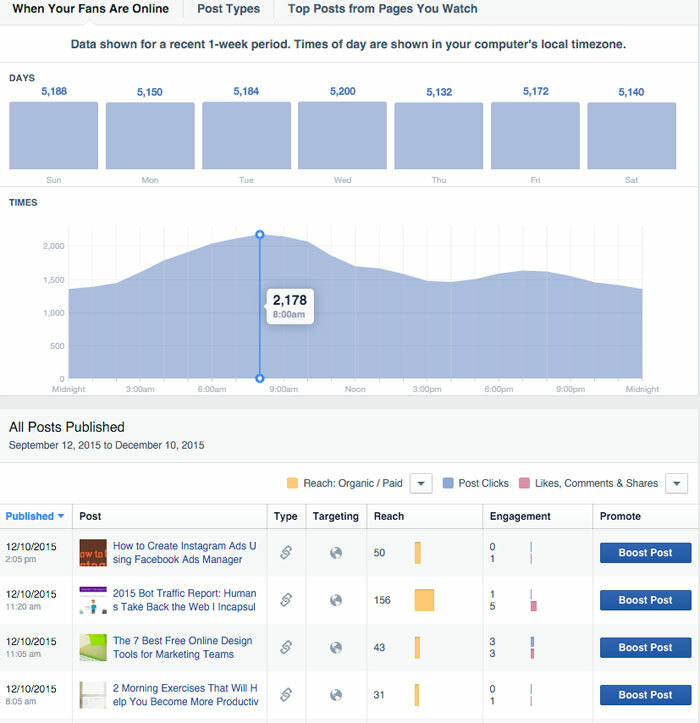 Knowing what works is the best way to refine your marketing strategy -- so you should review your Facebook Insights on a regular basis! If you own a Facebook group, you should try Grytics for a similar analysis of your group members, engagement, and top content. If you've opened your Facebook profile to followers, you can use Wolfram Alpha to get a little insight there too. Let the most important people in your Facebook marketing strategy -- your audience -- help you improve your Facebook marketing by asking them what they want to see from your Facebook page or group! You do it by asking a simple question on your page or go with a formal survey and gifts (just follow Facebook rules). Either way, you can use this approach to find out what to post, what people want to see, or even find out why people became a fan in the first place. Sometimes you'll get more out of an hour phone call than you will from surfing for the latest Facebook advice articles because you will be able to outline your problem, ask very specific questions, and get answers personalized for you. Networks like Clarity allow you to search for people who are willing to hop on the phone with you to provide advice on specific topics -- including Facebook marketing and advertising. Check out each expert's profile to see what they specialize in and read their reviews to make sure they will be a good fit before giving them a call. 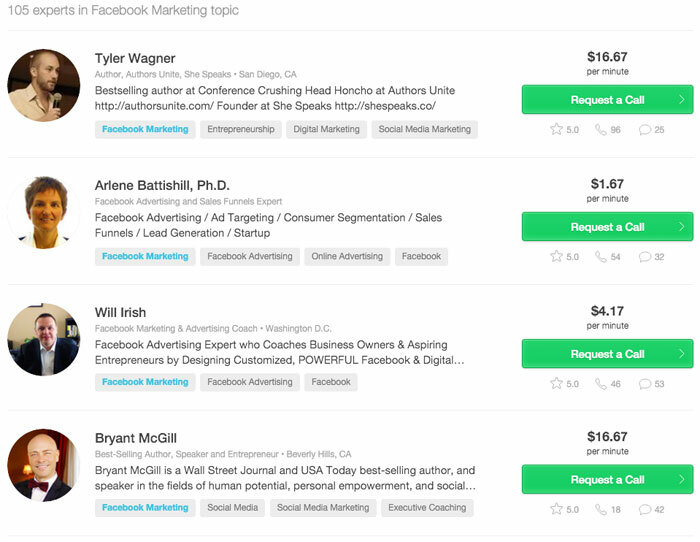 If someone asked you for your 2 best Facebook marketing tips, what would they be? The most useful tips are the ones that get results and sharpen your skills at the same time! 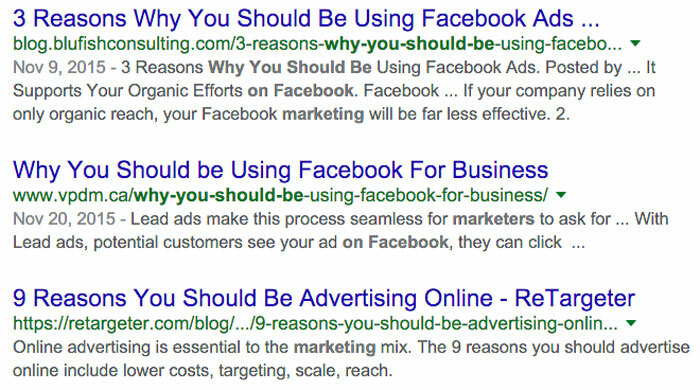 Just remember, as I mentioned, Facebook marketing tips aren't one-size-fits-all. The key is to select the nuggets that will fit best for you and your pages -- and then implement them right away. If those don't work as planned -- try something else! 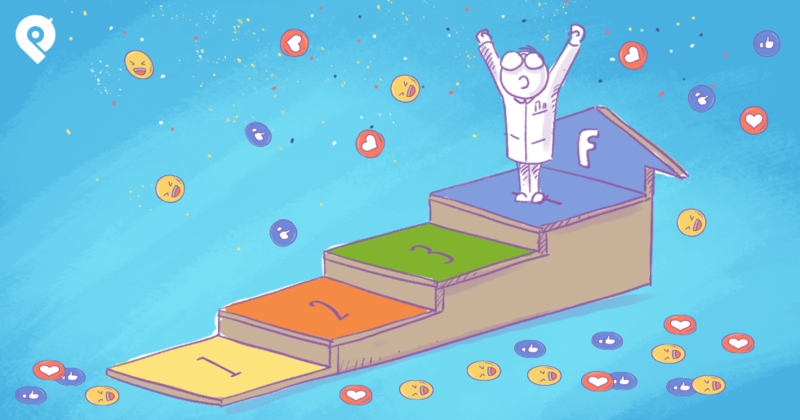 Fall in love with experimenting and testing on Facebook -- and most of all -- never stop learning. So now what? 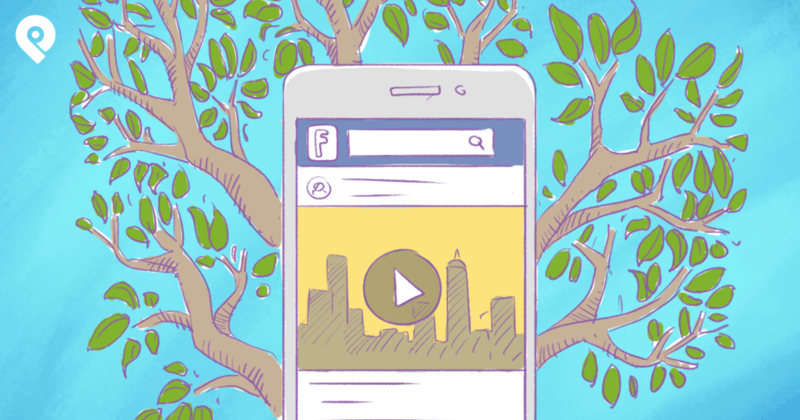 Ready to take your Facebook skills up another notch? Grab your copy of our infographic below and learn 12 secret Facebook features that will take your page to the next level. These are tips and tricks you can do today. Go ahead and get it (after all, it's free). You'll be glad you did!